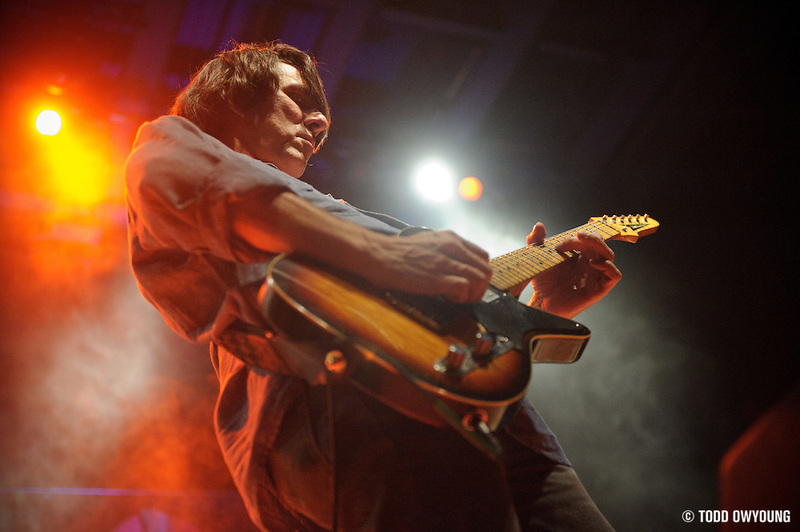 Mike Cooley of Drive-By Truckers. 1/160 and f/2.8 at ISO 6400 with the Nikon D700. I've printed this image 20″x30″ and you know what? It looks fantastic. These days, just about every digital camera better than your iPhone has a user-selectable ISO range. While choice may be paralyzing, there's always the concern of image quality as well. Since live music at indoor venues is often very dimly lit (by relative photography standards), I often get asked about what ISO I shoot at for live music photography, or what camera sensitivity I recommend for live music in general. Here's my answer on what the best ISO sensitivity to use is for low light photography shot in any kind of photojournalism capacity. For low light, high ISO work, there's really no such thing as “optimal” image quality. When there are constraints on lighting, time and position, it can feel as though almost every aspect of photography is one of compromise. Image quality is no exception – especially when you're shooting at the opposite end of the ISO range from a camera's “best” performance. Given the aforementioned technical constraints of live music photography, proper exposure for shows often comes down to a simple choice: Blur or noise? This is essentially a consideration between using a lower ISO and compensating with a slower shutter speed, or using a higher ISO and a correspondingly higher shutter speed, albiet with the consequence of increased digital noise (and other drops in image quality associated with high ISO). All things being equal, my personal take on this dichotomy is that I'll take noise over blur any day of the week. If high levels of noise is the worst thing someone can say about your images, then it means you did everything else right. Personally, I prefer to shoot between ISO 1600 and 3200 whenever possible with my Nikon D3 and Nikon D700. The reason for this one-stop range is that it offers very high quality in terms of acuity, color fidelity and lower noise levels while still offering a good degree of “speed.” For the venues and types of lighting I shoot, this range of sensitivities generally works perfectly with my f/2.8 lenses. That said, I also shoot above ISO 3200 whenever I need the speed for my work. My very first “big break” image of Radiohead printed double-page in SPIN was shot at ISO 6400 with the Nikon D3. There's no concern of noise in print, even at a stop above my “sweet spot” range for that camera. I've printed high ISO images shots (ISO 6400) from the Nikon D3 and Nikon D700 even larger, up to 20″ x 30″, and they look awesome. Ultimately, the best ISO to use is the one that properly exposes your subject. Though it's beneficial to have a preferred, “go-to” range of ISOs that one uses under optimal conditions, we all know that low light photography is so often anything but optimal. The main takeaway of this post is that there's no perfect or best high ISO setting. If anything, I recommend shooting with and testing your camera at various settings and getting a feel for the quality that each setting will render. This will allow you to make the most informed choice based on the image quality required for the show, client and/or assignment. Forget about a concern for noise, shadow detail or contrast – the best high ISO for you to use is the one that gets the job done. For almost all real world applications where you actually need high ISO performance, use whatever setting it takes. With the Fuji X-Pro1 I am shooting 1,000 ISO in the middle of the day. The pictures here were shot at daytime, with a polarizer at 640 ISO http://johnsmith-johnsimages.blogspot.ca/2012/05/bone-yard.html . I could NOT have conceived doing that a year ago! Hey John, thanks for the comment. Yes, the new Fuji X-Pro1 does extremely well even at higher sensitivities, like most all current DSLRs. A very informative post. I get the fact that “usable” is a totally nebulous term. Last week I shot Brian Head Welch and P.O.D. in a cave. With my D7000 ISO3200, f2.8 1/160… I still was underexposed by at least 2 stops.and as these are mosh bands I was super lucky to get any stop action at all. I gained about 1/2 stop going to ISO4500 still not enough stop action.. and even the raw images look like total crap from the noise. Does the amount of noise differ from a FF body to a DX body? maybe it’s a sensor thing. But even if I would’ve gotten good exposure I’m not sure I would’ve showed them due to the amount of noise. Maybe next time I shoot a show there I should try renting a D3s. Thanks again for all you share!! I continue to learn so much from you. I believe you’ve said something along the lines of “If you’re afraid of some noise in your concert photos, you shouldn’t be shooting concerts” before. Maybe I made that up, but I totally agree. However, when you end up with excessive noise, do you rely on Lightroom’s Noise Reduction sliders under “Details” or the Remove Chromatic Aberration option under “Lens Corrections”? And how much would you deem acceptable? Love the post. Quick question- do you have any of your camera’s built-in noise reduction features turned on? High ISO in low light photography is still the best way. For me, no matter with noise, because music photography without noise is a flat image and stage photogrpahy isn’t commercial photography with smooth image quality. May photographers better do art for himself, people, readers, and his subscribers, it’s not just for himself. In my private observation, most people are more love with a bright photos. Okay, if you guys read this comment, don’t blame me, I’m not saying low ISO in music photography is bad. Just share and it back to your own taste. Cheers. It looks like ISO 5000 is about as far as she’ll push her 5DmkII. The insight a little EXIF data gives you is fascinating. I get the feeling that as sensors have got better at dealing with high iso|s the acceptance of grain in concert photos has gone down. I was looking at a photobook by Mick Rock with shots containing golf ball sized grain from the 70s that just wouldn not get accepted by publishers nowadays never mind get in a book. My D300 starts producing noticeable noise at 1600, which is where I need for most correct concert exposures. Seeing as I cannot afford a D3 or D700 that would allow me 3200 to 6400, how about a post about noise reduction Todd? interesting discussion. I think, apart from the question how grainy the pictures get, we should talk about the color depth which decreases every time you push the ISOs. Grain seems not a big problem to me, especially since the Nikons produce a very nice grain. But according to the DxOMark tests for the Nikon D3 (http://www.dxomark.com/index.php/Cameras/Camera-Sensor-Database/Nikon/D3) the color depth (which they call color sensitivity) is 19.1 bits at ISO1600 and decreases to 15.9 bits at ISO6400. That means, that at ISO1600 the image can store 561.917 colors while at ISO6400 it only stores 61.147 different colors. That’s why images look flat at ISO6400 and have a (to my opinion) more cellphone-lile look. That’s why i always try to keep the ISO as low as possible. Sure, you can always fresh up the images afterwards while processing the RAWs or convert them to b/w but i prefer having the most information in my pictures than wasting image quality – which certainly has its limits when the action on stage is fast and lights are low. Hello Todd. I just finished my first music shoot with a D800. It was a jazz venue with very poor lighting. I ended up having to shoot ISO12800 at 1/180 f2.8 out of necessity. The image quality is amazing! It easily exceeds the quality I was getting in my film days shooting T-Max 3200 at ISO1600. In most of the smaller venues I am shooting, the lighting levels fluctuate significantly from a spotlight blast to nothing but low ambient. Shooting full-manual and throttling the ISO secdond-by-second results in some missed shots (for me anyway). I should have noted that my camera (5D3) allows me to set the MAX ISO allowable when the camera is in Auto ISO mode – so you can set the ceiling to 6400, for example. Hey Chris, I prefer not to use auto ISO because ultimately it means that I have to give up control of knowing exactly what the exposure is. I will use Auto ISO if I have a remote camera set up and it’s just being triggered remotely. Even though shooting full manual definitely has downsides, like you mention, I prefer it for my shooting due to the absolute control and consistency it provides. Love these articles, Todd! I’m still new to shooting concerts with “real” gear and your site has been a great source of info for me! But this particular article hit home. We have a local venue with very poor lighting. It’s almost gotten to the point to where I don’t want to shoot any more shows there. I set my standards pretty high (even knowing that I’m not a “Todd Owyoung”) but it’s still disappointing when I get those grainy shots. This article, however, helps me feel a little better about them. I wouldn’t worry too much about grain/noise in images. If you’re shooting in smaller venues, they’re going to look like smaller venues regardless of grain. The lighting is what it is — what you can do is focus on is nailing composition, timing, and perhaps even most importantly, building relationships with those bands to create unique images. Behind the scenes, portraits, etc. Hey Todd, just for curiosity, do you apply any denoise filter (for example NoiseNinja or just the standard Photoshop denoise) to your photos? I use Lightroom and have my chrominance noise reduction set to the default (25, I believe), and zero luminance NR. These are the settings I’ve used for the last several years. If I am printing large (20×30), I will consider luminance NR with the appropriate masking, but it depends on the image. Hey Ashlee, I think you could get away with the 24-85mm and Nikon D600. If you can, try and shoot more at 24mm — that’s where you’ll be pulling the most light. If it’s a small punk show and you’re right up to the stage, wide angle will suit you well anyway.